Over the past few months I can’t say how many hours I’ve spent drawing, on several nights, listening to classical music, countless. Noctural Animal realized by Tom Ford would be the perfect title to name myself actually. I was looking for inspiration, graphic wise when I clicked on what seemed to be a cover for something yet unexpected. The drawing cover caught my eyes even though the description was written in Japanese the name mentionned wasn’t. Iwamura Ryuta. It sound great. I did a quick research on Itunes and found his albums, randomly played the first tracks that appeared on the library : it was an immediate connection. I spent the whole night, headphones on, diving into his melodious sounds. I had to get in touch with him and somehow thank him about producing such wonderful craft. I was lucky enough to find him on Facebook, messaged him. We spoke a bit, in French then English, it was pleasant. Now, I live in Tokyo. I was born in Niigata city, a port city that faces Japan Sea.In my house, there was an old upright piano. It was a miracle and I was lucky to be born into a family that possessed a piano. I was primarily attracted to this beautiful piece when I was a baby. I think that it was something like an innate instinct. When I was 5 years old I started composing piano pieces in my own way until I was 11 years old then, I attended a piano school in my neighborhood. The teacher gave me good songs, pieces of Kabalevsky, Ibert, Akira Miyoshi, those piano were special, I felt some darkness when I was a child. I think it is wrong to say that children like just simplicity or brightness. At this time, my music preferences were determined to a certain degree. I didn’t go to musical college. I studied musical aesthetics and history at faculty of arts and literature in University, not composition. I’m a self-taught composer. Now, I’m continuing my music activities while working. Unfortunately my day to day job is unrelated to music. What attracted you to the piano? The piano has 88 Keys, it gives a great range of musical possibilities like an orchestra, it can play two or way more independent melodies simultaneously. It’s a marvelous thing to be able to do this by yourself. It also express music of various genres. In short, with the piano you can showcase a good range of expressions and that's what I think it is the most attractive thing about it. I remember a melody of lullaby that my mother sang for me. I listened to it while I was laying on her back. That was old Japanese folk song that was created in Edo Period, over 200 years ago. The melody was not influenced by Western music at all. The pentatonic scale was used in the melody. That was not bright melody. That was so dark and gloomy. I got sad. I think that was one of my musical roots. What was it like to be a musician here in Tokyo? Tokyo accounts for about 10% of the population of Japan, and many people come here from all over the world. I see Tokyo as a city of diversity, a city of diverse values. I mean, I’m hoping this city is. Though I’m not a very sociable person, I like to live while feeling the energy of people who have diverse values, talents and abilities. That helps motivating me to create music. But my reason for living in Tokyo is gradually fading with the development of the internet. Even so, I will live in Tokyo for the time being. What’s something you’ve realised about piano that changed the way you play for the better? Using Gravity. Using the weight of arm to press keys, not only relying on finger strength. When I was an elementary school student, a music teacher taught me the contrabassl. I also learned to play the trombone when I was a junior high student. Unfortunately, I completely forgot how to play these instruments. Could you walk us throughout the process of a wonderful track like "The Bird Has Gone"? As for «The bird has gone», what motivates me to compose this song was listening to the sounds of birds singing. This sound was generated by «Bird Songs Calendar» I bought in a toy store in Tokyo. I’m interested in various sounds that surrounds us, not only sounds that is generated by instruments. The sound that this bird toy gave me ideas about writting some melodies. I listened to them carefully, I can feel it at the bottom of my heart. I try and learned how to combine this toy sound with my musical sound. Then I sat in front of the piano and just began to write the score. The original version of this song was written for the piano and the accordion, but the strings version was recorded in the album «Tokyo Reminder». The strings arrangements was done by Oliver Kraus who isa great and world famous strings player & arranger. Please, take the time to listen to this wonderful collaboration work. How’s the project involving a different song for a different city was born? What was your inspiration? Yes, those particular ones. Well, I do like traveling, When I travel, I always take my handy recorder to record environmental sounds that I encounter during my trip. As I told above, I’m interested in various sound that surrounds us. Collecting sounds is something definitely one of my favourite hobbies. I had an idea to create music for each cities I visited using the environmental sounds I recorded. I named this serie «City». This suite will reveal the originality of soundscape that each cities have and I hope this is working enough so that you can appreciate the beauty from a city as a musical composition. I want to release this album someday. And how about Monday / Sunday Impressions? Tell us about the process of recording and what was the original concept? 4 or 5 years ago, I remember it was winter, an idea occurs to my mind. That idea was composing one short songs a week. I thought that would be like diaries or notes that were written in musical note and it would be good training for me for composition. On every Sunday and Monday, I wrote short piano songs. As a result, I wrote 24 little piano pieces. I might say that these songs were records of 24 melodies that came to my heart around that time. 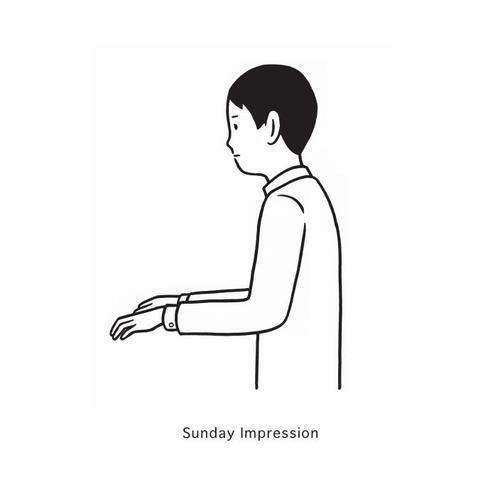 As for "Sunday Impression", I posted these piano songs on my Facebook on every Sunday. I probably wanted to say "hello" modestly to my friends or people I have never met. I changed its key at every songs, moving up a half tone: C → C♯ → D → E♭ → E → F → F♯..... Each songs of "Monday Impression'' were composed by using parallel keys of "Sunday Impression". These suites make a pair. That means the piano suite that used all 24 major and minor keys was completed for 24 weeks. Regarding this process, I have to confess that I was inspired by Bach's The Well-Tempered Clavier. What do you like about being on stage, do you get nervous? I haven’t done live performance actively until now. My first piano solo concert was at P Festival in Taipei last autumn.That was an international piano live event. Many talented musicians, Peter Broderick, A Winged Victory For The Sullen, Lubomyr Melnyk, etc were participated in this show. So I got nervous. But when I saw the crow, the audience from the stage, curiously I felt at ease and relaxed. I remember that I thought then that I have to do my best performance to be able to live up to their expectations. What was your favorite concert experience/s? I don’t go to concert much. But these past few years, I like going to concerts of Japanese traditional music, like Shamisen music, Okinawan folk songs, Japanese Buddhist chant, Gagaku that is type of Japanese classical music. I think I'm looking for my musical roots other than into foreign music. Do you feel like one needs to suffer to create music? When I’m composing, sitting at the piano for hours, heaving a big sigh. It might look like I’m suffering. No, I’m just absorbed in composing. Absorbing something is fundamentally different from suffering. If you feel suffering, what you are doing might be what you are not good at or what you don’t love. Which composer do you feel the deepest connection with? Except from classical music, what is your go-to music? Mmmm..., Let’s see what kind of music are in my iTunes now. Mac DeMarco, Bill Evans, Brian Eno, Caetano Veloso, Cornelius, Pengin Cafe, Okinawan folksong, Deee-lite, Holger Czukay, Sakamoto... It might be difficult for me to say what is my go-to music. How do you think the internet can help generate more interested in classical music? From a copyright point of view it is difficult to say "Please enjoy lot’s of music on YouTube"! I think it is good to be able to access to the intellectual properties of music that should be shared by all human beings. For example, IMSLP (International Music Score Library Project) is wonderful. We can get an enormous number of out-of-copyright music scores here. What piece of advice would you give to someone trying to become a pianist? I don’t know that whether I can say I’m a pianist. At least, I’m not a pianist that has super techniques. Let’s leave that aside for now. Well, If you really love the piano, please continue playing the piano from now on too, even if you are out of the spotlight. As a result, even if you failed to become pianist, what you had continued would make your life good. I’m nothing special. I don’t have any glorious career I love my ordinary life. I love each moment of my everyday live. That’s what I’m proud of. Where’s your favorite place you’ve traveled to? Every summer I travel the Kerama Islands that are located 30-40 kilometers north of the island of Okinawa. There are blue seas, beautiful coral reefs, so peaceful landscape. But during World War II, many people were killed there. Whenever I come here, various thoughts come and go in my mind.